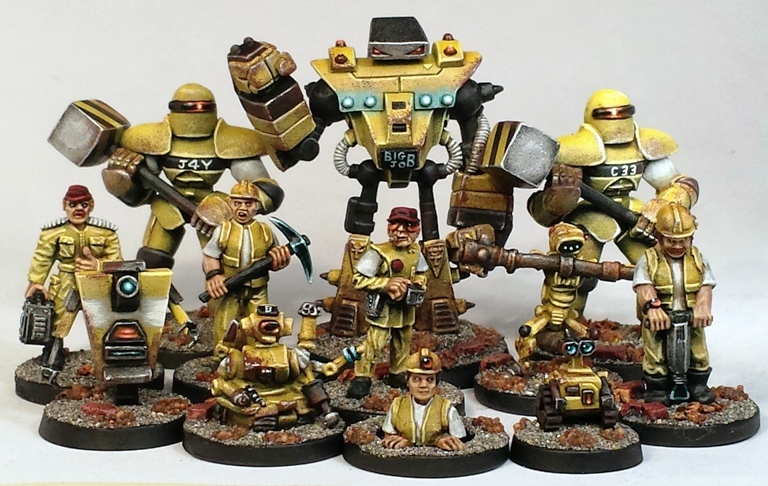 I took WIP photos while painting one of the second batch of Sci-Fi Construction Crew models last week. I did that in order to illustrate how I went about the process in a subsequent blog post, this post in fact. 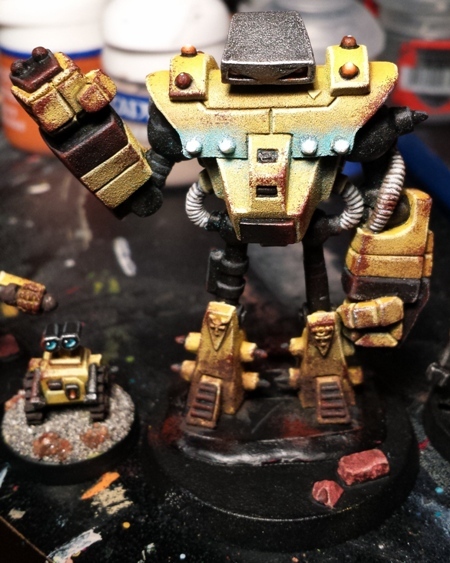 a couple of very simple weathering effects to give visual texture and to provide a simple way to cover up errors without having to match colours etc. Its all pretty straightforward as I like to keep things as simple as possible. A basic step by step pictorial run through follows. Step 0: the model is prepared in the usual fashion and undercoated black. I didnt take a photo of this stage. 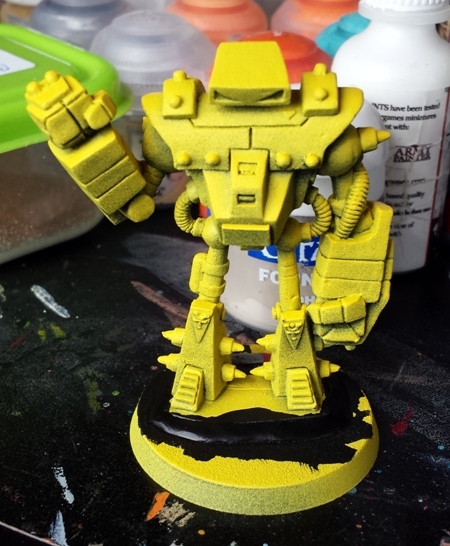 Step 1. the model is sprayed with Army Painter Daemonic Yellow from above only. The intention here is to get a solid colour only on the topmost surfaces and a graduation of colour on the undersides of the model, which remain black. There are a couple of ways that this can go wrong, so experiment on something disposable before you spray the model. 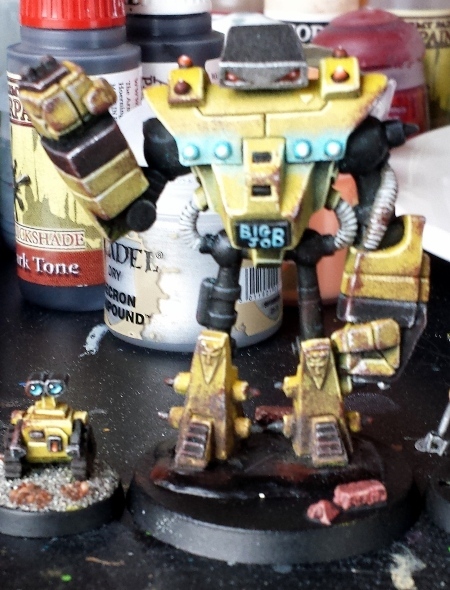 I took a couple of snaps of this stage of painting a similar model that might help here. Note how much coverage/lack of coverage there is depending on the where the viewer looks from. 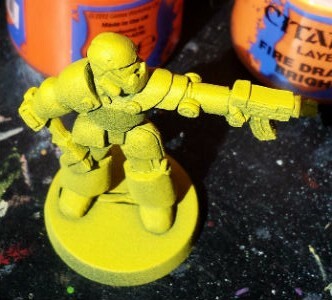 Step 2: GW Dorn Yellow – a pastel lemon colour – is quickly drybrushed/overbrushed over the entire model. Step 3: black is blocked in on selected areas. A gunmetal colour is painted on the head to match the comic book character. The tubing is painted a light grey (GW Astronomicon Grey). 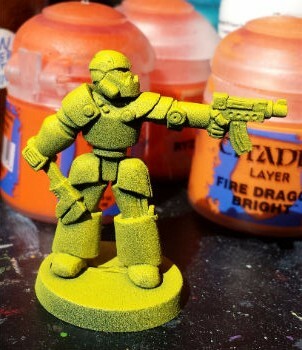 Step 4: the whole model is covered in Army Painter Soft Tone (the water soluble variety). The soft tone doesnt do much on the black areas but it shades everything else. The head is washed with Army Painter Dark Tone as the Soft Tone doesnt generate enough contrast.. 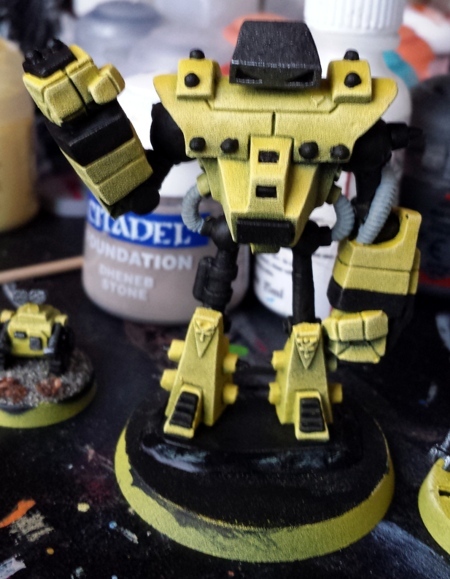 Step 5: the yellow areas are given a simple edge highlight of Dorn Yellow on the uppermost edges of the various panels etc. The tubing is highlighted with Game Colour Off White. The head is highlighted with a lighter silver. 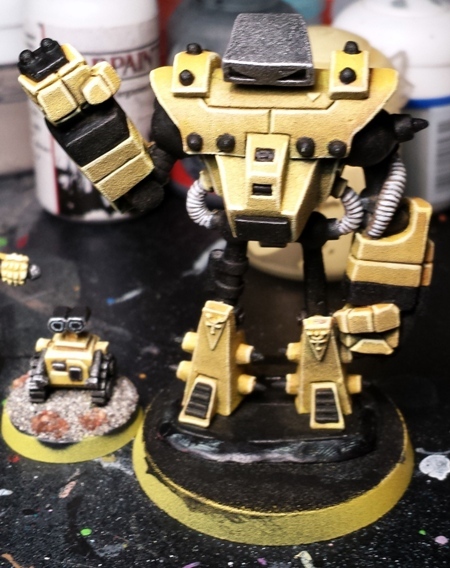 Step 6 : the black areas are given a simple edge highlight of GW Mechanicus Standard Grey on the uppermost edges. Step 7: firstly, a brown (I used artists Burnt Sienna) is dabbed on to selected areas using a scrap of foam (I used the foam that comes in blister packs with miniatures), occasionally held in a tweezers, sometimes not. The brown is applied more heavily in areas that would suffer more wear and tear, like the knuckles and the feet. Dab most of the paint from the foam before applying, a bit like when drybrushing, to make sure that you dont apply too much paint in one dab. This stage is also used to conveniently cover up errors in earlier work. Secondly, the eyes and the beacons on the shoulders are painted a dark orange. Thirdly, the studs on the front of the model are painted a light blue-turquoise and the surrounding area is quickly stippled with the same colour. 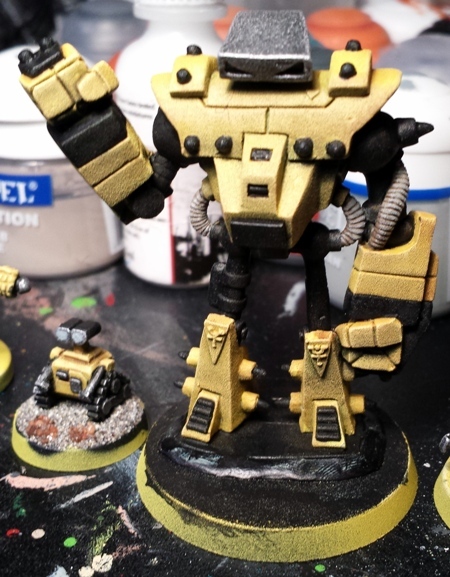 Fourthly, bricks are glued to the base and washed with Army Painter Dark Tone (this fourth step could have been done at any point since spraying the model yellow, but I forgot until this stage). Step 8: the lamps are stippled with a lighter version of the same blue colour. The eyes and alternate beacons are highlighted through a series of oranges (GW Troll Slayer orange, GW Fire Dragon Bright, GW Lugganath Orange, White). The lower legs and feet get a layer of GW Typhus Corrosion painted on with a brush and smudged with my finger from time to time, fading from the bottom up. Step 9: Small amounts of silver paint (mainly GW Necron Compound plus another lighter silver to a lesser extent here and there) are leanly applied to areas that already have had brown dabbed on them to represent further wear and tear. The lamps are highlighted further with white and “Big Job” is painted on to the screen using the same blue-whites. Step 10: the model is based and varnished to taste. This isnt how I paint all of my models, but it is a decent way to get a pretty good result relatively fast. It wont win prizes, but it will get pretty decent looking figures on the table for gaming with pretty fast. 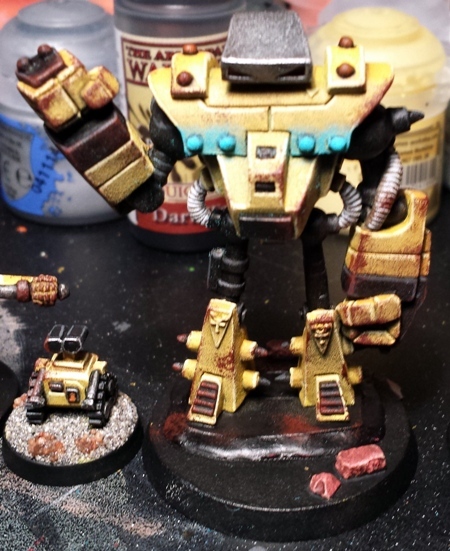 I am still a rookie when it comes to weathering, but I have been trying it on various subjects here and there for the last eighteen months or so (you may remember the Space Skeletons wrench and Mushrööm Klöwds Töör Bus). Im not that interested in adding extra time to the painting process – I have too many projects that I want to get done before the grave – but I am interested in things that make other parts easier, like covering mistakes as part of the next step, rather than repair work. I get a kick out of trying to boil a finish down to its minimal components, like a caricature or comic book version of a real thing rather than a photo real finish. Wow. 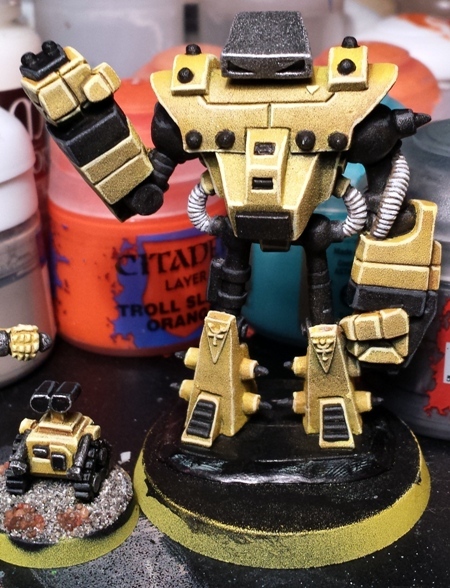 I find the bold contrast of black undercoat and yellow zenithal spray a… risky choice but it seems to have really paid off here. Great step-by-step! The yellow is a particularly satisfying colour to use like this. 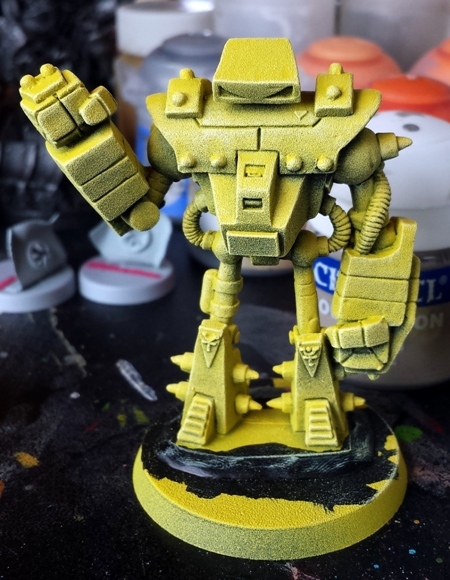 Because it can cause such technical problems for people yellow doesnt feature on gaming miniatures as much as other colours (in my experience anyway). I am very concerned with high contrast. Without it the hours spent painting become close to valueless when playing the games. I learned that lesson when I tried to be subtle with an army in the late nineties. Never again. I do like to chat with people about how I paint and to share nice photos, but gaming with the models is the central goal. If the contrast isnt visible from three feet/a metre away then it probably isnt worth doing. I still indulge in painting some things that dont get seen, but generally, I try to stick to that rule of thumb. You use a very similar style with your 15mm figs, Its something that I particularly like about your work, so you know what I am talking about intimately I expect. Wow! That is amazingly simple! I would never have thought drybrushing wss involved from the images. I never tried the AP sprays either. Now I’m curious. Well thought out and stunning results! Drybrushing gets a bad rep because so many bad examples of it exist: it tends to be seen as a beginners technique. The painting above isnt a great example of using it very subtly, but it shows that it is a valid technique I think. I drybrush on all my figures, I just dont tend to leave it as the final finish. It took me this long to notice the ‘Big Job’ readout… how is that possible? ? Great tutorial, it’s always nice to see how others go about their painting, the process always inspires 😀 cheers! Im glad that you liked it Cap! I dont paint everything like this, but some of the themes, attitudes and approaches shown here do follow through most things. To be honest it feels a bit odd showing how I paint in such detail, but as I enjoy seeing other peoples tricks and techniques I thought that I would put up some of my time savers. Thanks for the insights mate it’s nice when someone takes the time to do a step by step as it really helps to show what is meant, well done sir. I hope that you find it useful Frank. Being able to snap the model without having to leave the painting table made things a lot easier than having to stop painting and head to the light box and illuminate the fig properly. It was easier than I thought it would be. If I paint something similar in a way that I think might be useful I might do it again. Excellent work! Your “quick” painting still looks really nice in my view. Thanks Warburton. Quick completion is great, but there is a quality line below which I am not happy to go. 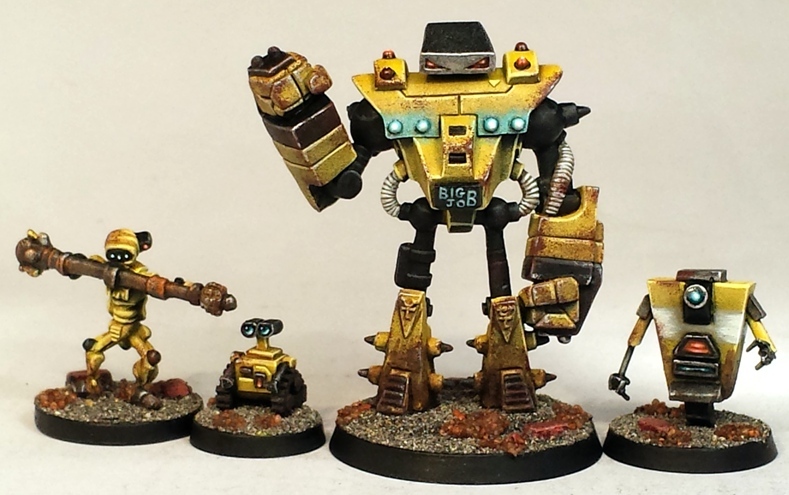 In many respects my painting processes are a constant battle between quality and quantity. I experimented a lot with dipping and other shortcuts about six years ago and found my baseline. Since then I have added more quality/time back to the process but boiling it back down to basics was worthwhile: I learned quite a few things. And contrast is key. Without it its just a waste of time in my opinion. Always good to see what others are doing as well, especially those with consistently good results like you, if I may say. I find that I am constantly tweaking methods and approaches to painting. The process never remains constant for long. It means that occasionally some finished elements end up slightly disappointing, but overall the constant refining and experimentation has stood to me I think. The overall end product improves. I am stealing this. I am. Wonderful explanations about a very well thogh process. Really nice to read that. I am a little fussier when painting most models than I was with these (I didnt even really highlight the hair on the human elements), but this is a fairly good insight into how I approach things currently, although in a years time it will be different, its always changing. I’ve been looking forward to this. The zenithal spray is something I’ve not tried yet, but I think I’ll be giving it a shot. I must get some soft tone too, I’ve gotten used to just using dark tone. 2) because the zenith spray over black already adds heavy shadow in places, so the Soft Tone is then enough to define the rest. B) not to spray too much of the model (or the shadow effect becomes redundant). Gauging this can be tricky. 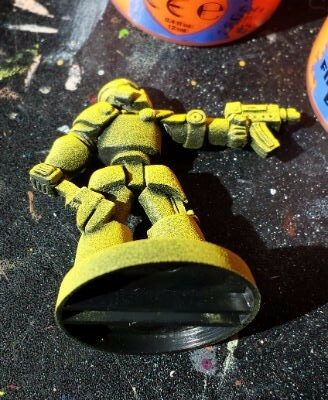 C) to avoid overspray (when the paint is being applied from too far away and drying slightly en route from can to the model, creating a dusty, textured finish. A little of that is ok, even mildly favourable is some limited circumstances, but too much and the model can look kinda furry. I hope that you get some use out of something here Mr S. Thanks for the feedback. I would actuallly like toi know if the zenithal is only a 12 o clock spray or if you add quick rund from say 1 and 11 o’clock? It depends on the shape of the model really JB. I find that the spraying is never exclusively just from 12 o’clock: there is usually a bit of manoeuvring between vertical to approximately 45 degrees from centre. A lot depends on the shape of the model and how much of the model is obscured by cloaks or arms or weapons or hats, how much it may lean in one direction or other etc. How much you counter that effect or utilise it is down to taste. Its the sort of thing that is much easier to get a feel for when doing it yourself, rather than explain in text. You will be able to make the call if you try it I am sure.